Bacterial biofilms provide systems of the complexity needed to exemplify many of the generic features of multi-cellular behaviour, without such complexity at once becoming overwhelming. They are in addition of enormous environmental, industrial and medical importance. Many processes in biofilms operate at the macroscopic scale and are thus susceptible continuum modelling approaches. It is essential, however, that models incorporate in an appropriate way information about the micro-scale behaviour and their results must in turn be coupled back into the rules adopted in the cell-scale modelling, motivating the use of agent-based modelling. The simulation of such complex systems typically requires huge computing resources. The Grid provides an unrivalled technology for large scale distributed simulation and is exceptionally well suited to addressing the challenges raised by integrative-biology. In this paper we present BacGrid, a system for performing distributed simulation of bacteria using the High Level Architecture (HLA) and the Grid. We present the bacterial model and show results from initial experiments investigating the role of quorum sensing molecules (QSM) in the development of the bacterial colony. We go on to sketch out the design for the distribution of bacterial simulation components across the Grid and indicate how this technology can be used to create large scale simulations. We conclude with a discussion of the current status of the system and our plans for future work and experiments. BacGrid models a 3D biofilm reactor, with bacteria growing inside a rectangular box with periodic x and y boundaries (see Figure 1). Bacteria, substrate and other material is assumed to be washed away once they reach the z boundary (detachment layer). BacGrid is a simulation in which agents are particles that represent collections of bacterial cells. The size of these particles can be varied, from a minimum size where each particle represents a single cell, to a size where a single particle may represent hundreds or even thousands of cells. Particle based simulation  has the same advantages as individual based models (IBM) while reducing the computational requirements for such simulations. We model substrate uptake, growth and maintenance of each individual particle using equations from . Particles are contained within voxels, which are small 3D volumes of constant pressure, substrate and QSM concentration. Substrate and QSM diffuse between voxels and particles are transferred between voxels when there is a sufficient pressure difference. Computational domain of BacGrid Model. Parallel and Distributed simulation is a well established field of research  which has been applied in a wide variety of areas. The High Level Architecture (HLA) , is a simulation standard developed by the US department of defense, Defense Modelling and Simulation Office (DMSO) (now IEEE standard 1516) which describes a set of services which allow different simulators to inter-operate. In the context of distributed simulation and distrbuted computing in general the Grid offers potentially unbounded computational resources. The development of HLA_GRID  allows HLA simulations to inter-operate across the Grid, the result is the ability to run large scale simulations across the Grid. The BacGrid simulation has been developed using the MASON agent toolkit and is designed to be HLA compliant, which means the simulation (Federation in HLA terms) can be split into multiple simulation components (Federates). Using HLA_GRID it is then possible to execute different parts of the BacGrid simulation on remote machines connected across the Grid. 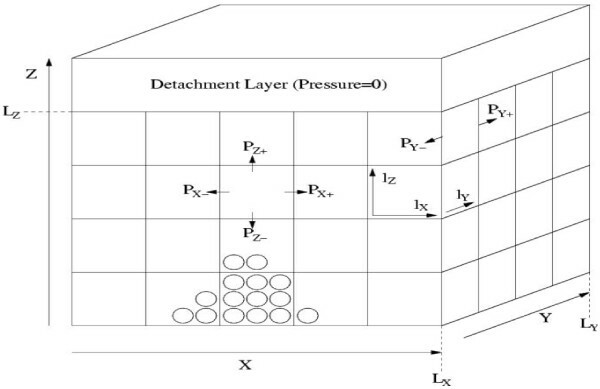 A BacGrid simulation is decomposed into two component types, a Diffusion federate and a model region federate. To do this the BacGrid model domain is decomposed into model regions which are collections of voxels, the model regions then execute on remote machines and communicate with each other and the diffusion federate through HLA_GRID. Current work involves completing the distribution of the model and reimplementing HLA_GRID for GT4 in an attempt to reduce the overhead associated with Grid service invocation reported in , Once this work is complete, we plan to experiment with running simulations across the Grid between Nottingham, Singapore and Birmingham. One of the goals of Grid enabled simulation is the ability to compose models automatically allowing experimenters to use or combine their models with existing models, possibly creating multi-scale (both in time and space) models. This is an area of work we would like to investigate in the future, integrating BacGrid with individual cell models creating bacterial simulations that execute from the sub-cellular level all the way up to the level of the entire population. BacGrid is a collaboration between the School of Computer Science and the Centre for Mathematical Medicine at the University of Nottingham, and forms part of the BBSRC project Agent-based Integrative Modelling of Bacterial Populations (project number BB/D006619/1). John King and Brian Logan also gratefully acknowledge the EPSRC Discipline Hopping awards (project numbers EP/C549414/1 and EP/C549406/1).